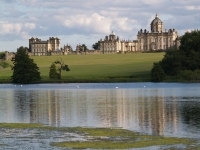 Award-winning Castle Howard is one of York's most striking attractions. Home to the Howard family for over 300 years, the castle took 100 years to build, outliving several architects, craftsmen and three earls, before eventually becoming the setting for the popular TV series, Brideshead Revisited. The spectacular estate comprises acres of farmland and exquisite gardens, while the interior is a treasure trove of paintings, furniture, sculptures and more. Visitors can enjoy a self-guided tour, but historical costumed guides are available to answer questions and share information about the history of the house, the Howard family and the collections. Regular guided tours are also available, and the castle frequently plays host to a range of exhibitions, lectures, events and dinners. The castle also has a gift shop, cafés and a plant centre.